Organizations operate within limited solutions spaces. They look for ideas inside the boundaries of their available insights and experiences. 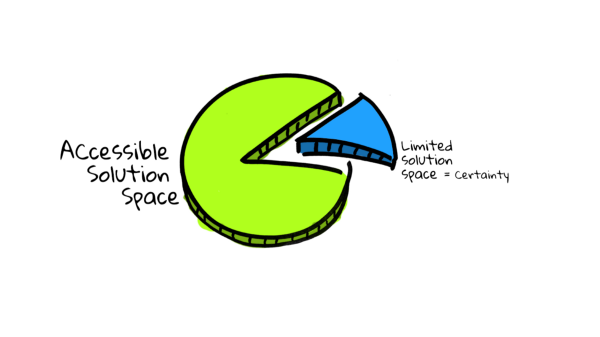 We look for ideas inside our finite solution spaces. This immediately introduces some challenges to organizations that in my experience might be severely hampering our ability solve problems. It is not that companies are poor at finding solutions, quite the opposite — we are both brilliant and efficient at it. The problem is we find reassurance and certainty with what we already know we know and comfortably reject the idea that the we don’t posit infinite knowledge and have a universal awareness of all possible outcomes for each problem. But, are we aware of this? The dilemma is that companies seemingly thirst for knowledge but at the same time thrive in certainty? It reminds me of the analogy where two people meet a man on all four under a street light. They ask him what he is doing and he replies that he lost his keys over there — pointing into the dark, and he is trying to find them. “But why aren’t you looking over there” the two people ask. “Because the light is better here” he answers. Why do we shun uncertainty? As if it’s something we can avoid. Isn’t the problem rather that we are living in perpetual uncertainty, but have convinced ourselves that we as an organization can institute a superpower of control? I would entertain the idea that companies unconciousely build and protect solution spaces. They seek out their answers within these boundaries and when challenged build bigger walls — protecting them from new perspectives and new ideas. This is why Hamel points out that unhinged we are enormously creative and inventive. But rather than seek a strategy that unlock and master the uncertainty that comes from our infinite pool of imagination organizations wrongly think that strategy is about conformity and control.